I saw a post on Earth 911 this morning about Mason jar crafts that caught my interest—and forced me to raid my recycling bin and craft cabinet for a spur of the moment project. As I looked through the photo slideshow at Earth 911—I knew exactly what I could make with a few recycled glass jars, fabric scraps, and ribbon. I could finally get rid of plastic bags of dried beans, lentils and rice—and change up my kitchen wall décor all at once. I like multitasking and I have despised plastic bags of dried beans since the day that I dropped a full bag of dried, split peas on a cup of tea—and the bag was skewered by the teaspoon leaving me to find split peas in random spots throughout my kitchen for months. Recycling glass jars to use for storage…free supplies…less than an hour of arts and crafts time…and it could prevent a repeat of the split pea fiasco. 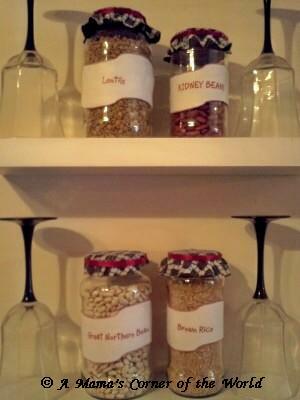 I had to make Bean and Rice Dry Storage Containers from some recycled glass jars. Determine your storage needs. Assess your storage needs. I took a look through the cupboards at some of the items that I wanted to store and display in the jars. 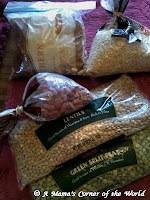 I had a pound of great northern beans, a pound of lentils, a pound of split peas, about a pound of brown rice, two pounds of long grain and wild rice, and a half pound of kidney beans which I thought would display well in the glass jars. Round up glass jars from the recycling bin. My power of estimation proved to serve me well. A large spaghetti jar held a little over a pound of dried Great Northern Beans, a large jelly jar held a pound of lentils, a pizza sauce jar was perfect for a half pound of kidney beans, and a salsa container worked well for around a pound or so of brown rice. I also have my eye on another spaghetti sauce jar for some split peas and two huge applesauce jars for popcorn and long grain rice. Prepare the jars. 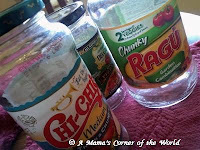 Clean each jar, remove the labels, and thoroughly dry each jar. Some labels scrape off easily after a little soaking while others take a little work. Gather items for decorating. 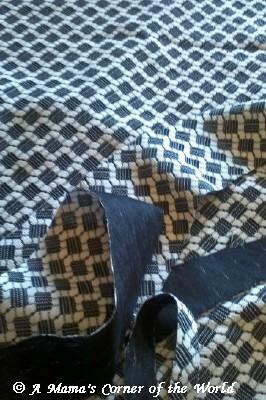 I opted for some black and white fabric that was left over from my daughter’s Amelia Bedelia hat that we made in second grade and some leftover crimson red, satin ribbon from another daughter’s preschool princess costume. The red, black and white matched other items in my kitchen and the color scheme seemed right in place on the white wall shelves. Choose some fabric scraps in a desired color scheme—you only need enough fabric to create a circle 1 ½ inches larger than the diameter of your jar lid for as many jar lids as you wish to cover. 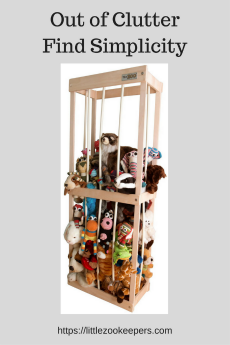 Raid your craft storage for coordinating buttons, ribbon, beads, bows—or anything else that fits the theme and style of the space where the jars will be displayed. Prepare the fabric circles. 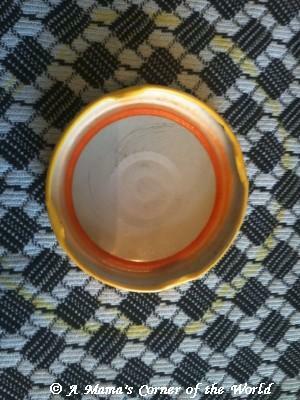 Use the lid as a guide and make a mark approximately 1 ½ inches from the edge of the lid. 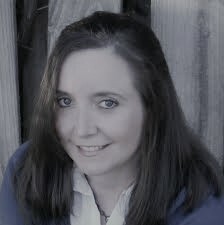 I used a compass (also borrowed from a daughter) to create circles with a chalk pencil that were 1 ½ inches wider than the lids all the way around. Cut out each circle. 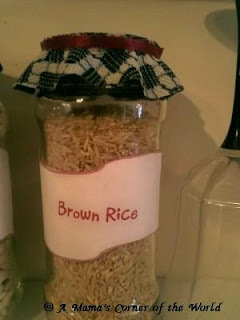 Glue the fabric and decorative items onto the jar. Turn the fabric circle face down. Using a glue gun, begin by adding a trail of glue onto the top of the jar. Turn the lid face down onto the center of the fabric circle. 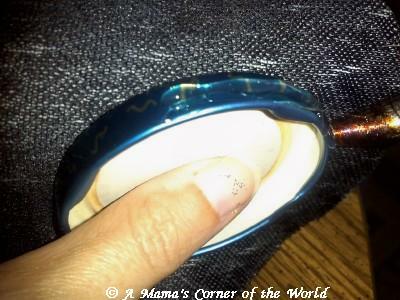 Press gently to seal the fabric to the top of the lid. 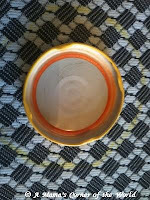 Run a ¾ inch trail of glue along the edge of the jar lid and gently press the fabric circle onto the edge, allowing it to create random pleats as the “extra” fabric adheres to the lid. 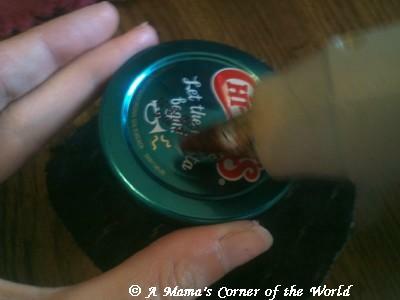 Continue working around the jar lid in ¾ inch segments, pressing down the fabric and “pleating” it as your move around the lid. Glue on ribbon if desired. 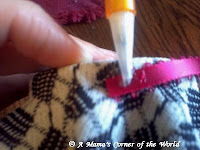 Begin by applying a dot of glue and pressing down the ribbon with the end of a pen or pencil. Move again in ½ inch or so increments, adding a trail of hot glue and adhering the ribbon—continuing to press it in place with a pen or pencil. Overlap the end of the ribbon slightly with the start and press firmly to seal the ribbon. 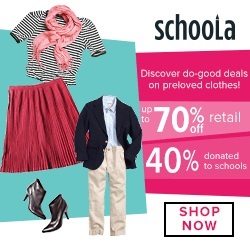 Add any other desired embellishments. Prepare a label. We simply created super quick labels in a word processing program in a coordinating color and printed them on a standard printer. I wanted an odd shape and didn’t have the appropriate label stock size on hand—so I actually printed them on regular paper and simply glued them to the jars. Get creative with the labels! This was the most time consuming part of the project for me—I played with fonts and colors for quite a while until I found a combination that I liked. Center the label on the jar and stick it in place. Fill the jars and display. I used jars of different shapes and sizes—so I played with the display space a bit until I liked it. I made sure that I had lots of fabric and ribbon to complete additional jars as the need arises and the jars empty! This was a really quick and simple craft that I see turning up again in a few months as homemade holiday gift containers. I should have done this months ago--maybe even before the traumatic the split pea explosion!